A Triton submersible allows the intrepid yacht owner to provide family and friends with the ultimate adventure; one that is safe, comfortable, fascinating and rare. Owners are in the enviable position of being able to witness incredible sights, make new discoveries, and aid scientific communities. All this on a schedule and in a fashion of their own choosing. Diving way beyond the capabilities of scuba divers, Triton owners enjoy unique opportunities to see huge barrel sponges, photo-luminescent creatures of all types, rare invertebrates, unique deep water fish and massive deep sea sharks. This, and more, can be enjoyed by anyone, of any age, and without the need for dive gear. A guest aboard a Triton can stay comfortably submerged for up to 12 hours, in an air conditioned and temperature controlled environment. Hand stitched leather seats and an integrated sound system help to make your Triton a comfortable place to relax, especially during extended dives. Regardless of depth, the interior of the passenger cabin remains at surface pressure, one atmosphere. As a result, a Triton can dive and surface rapidly with passengers fully protected from the pressure-induced physiological effects experienced by divers. Triton offers a range of submersible models to address the space limitations and arrangements of most motor yachts while working with yacht designers and builders to ensure theirs submersibles stow easily and integrate seamlessly with onboard launch and recovery systems. 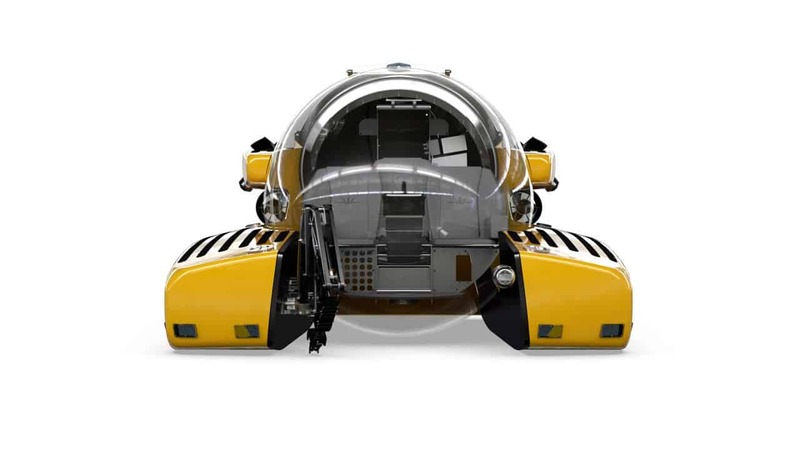 Triton 1650/3 LP is the world’s deepest diving compact superyacht submersible, capable of taking a pilot and two passengers to 500 meters in perfect, air-conditioned comfort. The deepest diving personal submersible designed and produced specifically for smaller superyacht tender garages, this lightweight, low-profile version of Triton’s most popular acrylic personal submersible model is designed and engineered to take a pilot and two passengers to depths of 500 meters in air-conditioned comfort. With a height of just 1.8 meters and a modest crane weight of only 4,000 kilograms, the Triton 1650/3 LP can easily be stored, deployed and retrieved from a tender bay that is equipped with an overhead davit rated for typical tender launch and retrieval. Triton is committed to producing the best deep-diving submersibles on the planet and provide a truly memorable, visually captivating and immersive underwater experience.